Shungite is a powerful mineral by itself due to its unique properties, but its shape may change the way you experience its effects. Different shungite shapes can be used for different purposes and intentions. To choose the shungite shape just for you, at first, we recommend you to listen to your heart and look at the pictures. It is extremely important to trust yourself, you will know which shungite shape is right for you. As soon as you decide which shape you love the most, read the descriptions below and make sure that it is the shape you need. If it appears that the shape is not for you, read on and get to know everything about them! Also, you should consider how you are going to use the shungite products – are you going to hold them while meditation or are you going to place them on your table? 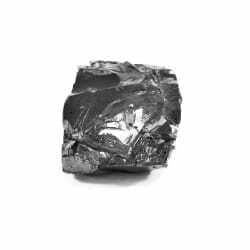 We hope our article will help you find your personal perfect shungite shape. The tumbled stone shape is one of the most common shapes. Tumbled shungite has been smoothed from its raw form so it feels nice and doesn’t scratch other objects or skin. Due to tumbled stone’s polished beautiful surface, it will make you happy to just look at it. In general, tumbled shungite stone is a great one to start your adventure with shungite as it has many different ways to use. You can put it under your pillow to sleep well, put into your pocket to be protected from EMF radiation, place it on your office table or even in your car to feel the positive vibes of the stone. Some of our clients buy several tumbled stones and use different ones every day – they choose the one that resonates with them better. Tumbled shungite stones are great for crafting and DIYs, for example, to make your own shungite jewelry or souvenirs. Tumbled stones are also quite affordable. Ancient Karelian inhabitants worshipped stones that had a spherical shape. For example, there is a huge spherical stone that was carved by ancient Karelians more than 2000 years ago on a mount Vottovaara (one of the most famous ritual places in Karelia). This unique stone was used in different rituals, such as healing, good weather and fertility rituals, rituals against evil energy. The shungite sphere emits energy smoothly and evenly in all directions. Shungite spheres are often used in scrying and meditating. Meditating with a shungite sphere in your hand or simply when it lays in front of you or behind you will let you feel the energy of your surroundings. Sphere symbolizes Earth and other celestial bodies, so if you want to connect with the space energy – shungite sphere products are the best choice for you. The sphere is also easy and comfortable to hold in your hand and they look beautiful as minimalist home decorations. Looking for stability? Go for the grounding energy of a cube. 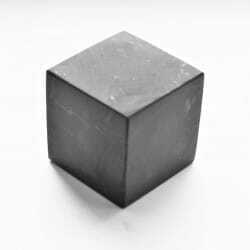 Owning a shungite cube you will feel the connection with Earth. The cube is also stabilizing, it will help you feel peaceful. 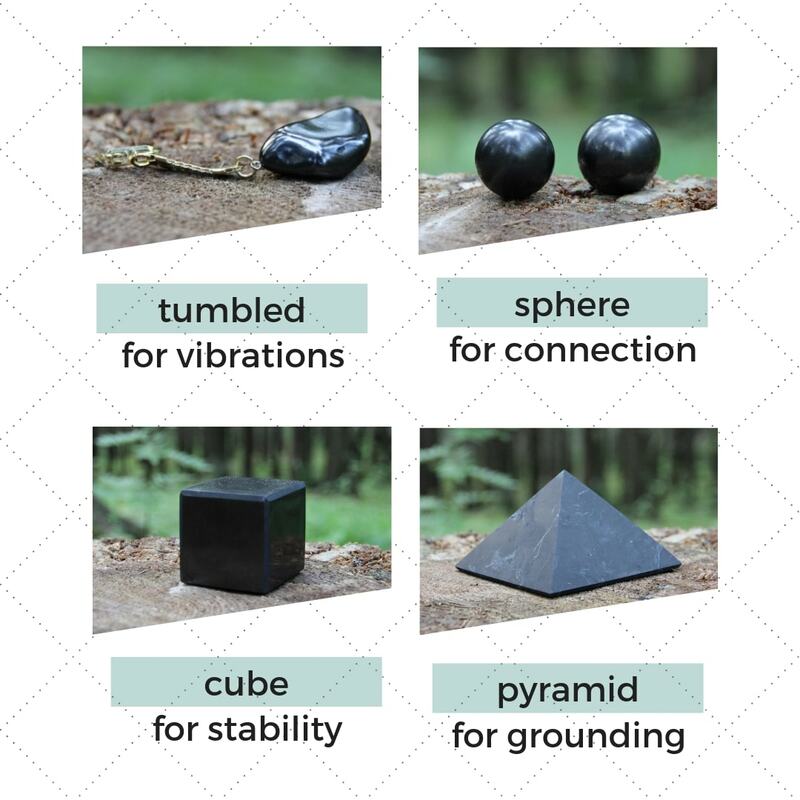 With a shungite cube, you will be more stress-tolerant, which is extremely important in the contemporary world, where everything goes so fast that some people simply cannot take it. Cube’s smooth and straight lines symbolize stability, order, rationality, security and equality. The cube is a powerful shape for chakra healing. For example, Antahkarana Symbol is a cubic symbol used for all types of chakra healing and balancing, but most of all, the cube shape is associated with the root chakra. It means that owning a cube shungite you will not only be protected from EMF radiation but also will feel secure, safe, it will protect you from negative energies and keep you calm and happy. We suggest you place shungite cubes in each corner of your room for personal comprehensive protection and for the protection of your household. The pyramid shape is widely used with crystal and mineral products, but it is not only because pyramids look pretty, there is also a symbolism that goes back centuries. In Ancient Egypt, the pyramids were not only used as burial sites but also as powerful healing chambers. Egyptians believed that pyramids symbolize rays of the Sun, due to that they collect the healing energy of the Sun and thus help the body fight negative energies and diseases. It is not widely known, but pyramids were built way before Ancient Egypt. There are pyramids found in Russia, near the Republic of Karelia – on the Kola Peninsula, that are twice as old as Egyptian pyramids. Scientists say that the pyramids were used by shamans to connect with Earth and its healing energy. Shungite pyramids are both collecting and giving out the energy. The bottom of the pyramid represents a solid, earthy foundation, which makes you feel steady and powerful, whereas the pointed top represents being able to reach into higher spheres of consciousness. Meditating with a shungite pyramid you will relax your body and mind. By placing a pyramid on your table, you will make it a point as a unique decoration and also it will protect you from all kind of negative energies and EMF radiation. Shungite harmonizer is a must-have accessory for effective crystal healing. Crystal harmonizers are widely used for meditation and healing, and shungite harmonizers are one of the most popular due to shungite’s unique properties and the mineral’s proved effectiveness. Crystal harmonizers were invented by Ancient Egyptians for pharaohs, they were called «Wands of Horus». You can notice that pharaohs are often pictured holding a harmonizer in each hand. The harmonizer held in the right hand (ka or yang) symbolized the solar energy (masculine principle), the harmonizer held in the left hand (ba or yin) represented the lunar energy (female principle). Egyptians believed that using cylindrical harmonizers you can restore a sense of balance, achieve a gradual evolution of your energy potential and of your psychic capacities. Harmonizers work on the principle of a “difference in potential” between the two harmonizers: subtle energy runs through the body of the person. Harmonizers are essential for chakra healing because they influence 6th (Third Eye) and 7th (Crown) chakras as harmonizers are held in hands. This means you will feel in tune with both the physical world and the material world, harmonizers will bring you happiness, good health, and wisdom. The type of energizing and balancing effect depends on the qualities of the materials used. We recommend using a shungite harmonizer as a yin harmonizer and to hold it in the left hand, and a soapstone harmonizer as a yang harmonizer and to hold it in the right hand. This is one of the most common shapes of stones and crystals, it has one pointed end and one rugged end. This shape can be used for many types of healing practices and is a good shape for beginners. It is a powerful shape for manifestation, shungite points will help make your dreams and goals come true by pointing your energy directly to the universe due to its unique and practical shape, just hold your shungite point with the pointed end upwards and focus on your biggest dreams and positive memories. Shungite points are useful for healing practices. Holding the point towards the body draws positive energy through the crystal directly into the body, holding the point away from the body, on the contrary, draws negative energy out of the body. You can hold a shungite point towards any part of your body that you feel could use some extra positive vibes, for example, you can put it to your spine if it feels sore. Shungite points can also be used to raise the positive vibration of location. You can place it on your working table or on your bedside table. Apart from that, shungite point will be excellent for the central stone in your crystal grid. The pendulum is a mysterious shape which unique properties Galileo Galilei started studying in the 17th century. All throughout history, pendulums have been used to find water, gold, gems, precious minerals, and other essentials. Nowadays, pendulums are often used as tools for spiritual healing and inner growth. 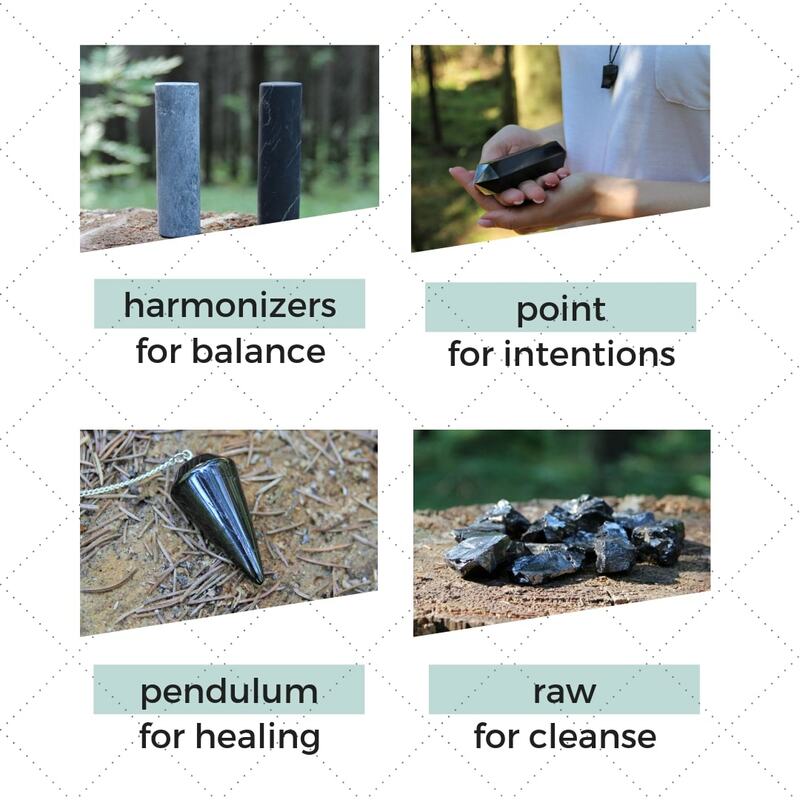 They are widely used for chakra healing and balancing, and shungite pendulum is your future go-to item if you want to cleanse your body from negative energy. We recommend you to keep your new shungite pendulum close to your body for a couple of days so that the pendulum gets to know you and understand what exactly your body needs. After that, you will be able to find out what chakras need balancing and healing. Lay down on your back and hold your shungite pendulum on a chain or a cord above every chakra one by one. If the pendulum moves clockwise, that chakra is balanced and healthy, if it moves counter-clockwise, there might be some blocked energy or emotions. Raw elite shungite stones or raw regular shungite stones are considered to be the classic shape of shungite. Due to the raw form, as found in nature, they will not lose their power for a very long time. Raw shungite stones can be used for many different purposes. For example, meditating with a raw shungite stone in hand you will feel safe and balanced. By putting a raw shungite nugget in your pocket, you will feel the positive and energizing power of the stone on a daily basis anywhere you go. You can also place a raw shungite stone on your table or a TV set to be protected from the damaging EMF radiation. Raw shungite stones are widely used for water purification. The greatest advantage of using raw shungite stone for water purification is that you can reuse them as many times as you want, the raw stones will not lose their absorbing properties, especially if you recharge them in the sunlight. There are many different shapes of shungite products, and we hope this guide helped you find something special for you, your family and friends. Or you can try them all to have every option for any purpose! Petrovsky shungite polished pendant "Pendulum"